Middle school students get their lunch at the school cafeteria. A new program launching this spring will introduce Maine students and schools to local food products, according to a recent announcement by the Maine Department of Education, and organizers are looking for Maine farmers and producers to participate. The program is called Maine’s Harvest of the Month Program. Participating schools pledge to serve certain seasonal, local products in their cafeterias at least twice a month. So far, 115 schools have signed up to participate. “The overarching goal is to bring healthy, Maine products into schools and to support our local farmers and producers,” Stephanie Stambach, child nutrition consultant at Maine Department of Education, said. Each month, participating schools will be provided with posters, stickers, recipes and other promotional and educational materials about the local product for that month. For the pilot program, Maine’s Harvest of the Month Calendar is: potatoes for January, root vegetables for February, protein for March, dairy for April, wild blueberries for May, leafy greens for June, summer squash for July, cucumbers for August, tomatoes for September, apples for October, brassicas for November and winter squash for December. To help food service directors source each month’s product, the program will provide a list of participating farms and producers. “It’s up to each school district who to source from, but we want to have farmers and producers sign up so they can be a resource for these schools,” Stambach said. A collaboration between the state Department of Education and the Maine Farm to School Network, the program is part of a nationwide marketing campaign to promote the use of seasonally available, local products in schools, institutions and communities. The program is funded by the USDA, though each school is expected to purchase the local produce through their food service budget. 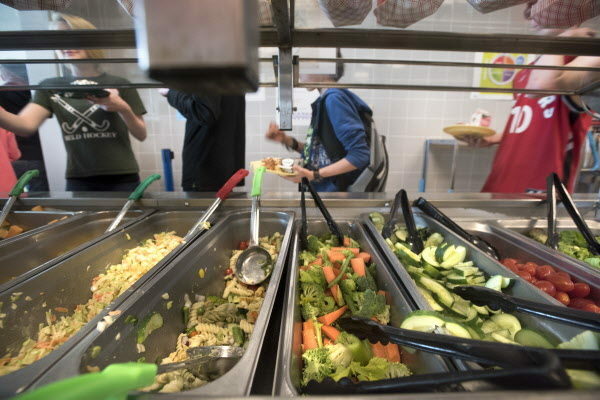 To help with this expense, Strambach suggests that schools take advantage of the state Local Produce Fund, which matches $1 for every $3 that a school pays for local food products. Though the pilot program will provide educational material for cafeterias, including posters with artwork by Rockland artist Alanna Hernandez, it will not provide any lesson plans or materials for introducing the local products into the school curriculum. For educators interested in doing that, Stambach suggests looking at resources provided by Maine Agriculture in the Classroom, a grass-roots program coordinated by the U.S. Department of Agriculture with the goal to help students gain a greater awareness of the role of agriculture in the economy and society. For information and to sign up as a school, farmer or producer, visit www.maine.gov/doe/harvestofthemonth.